This is a beach house for a family of five. It was intended that the house create a story of passage from suburbia to the beach and the horizon beyond. 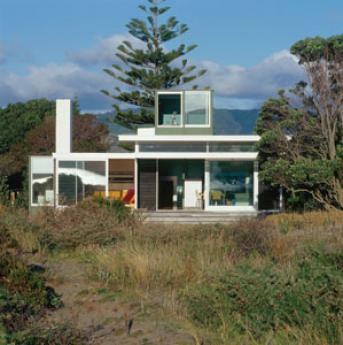 From the street the house appears as a slightly adhoc arrangement of separated forms, with fibre cement sheet boxes anchored to the ground and lighter forms floating around the side, leading to the beach. The living area is a raised pavilion from which to enjoy the hot summers and views of the sea. Metaphors related to the location are threaded through the design. These are present as you pass through or stay in the house, adding a resonance that is not necessarily fully discovered.